Most of us are used to seeing the words "Detroit" and "Downsizing" in headlines. And we know what to expect. But today's New York Times story on the "Downsizing of Detroit," written by Bill Vlasick, is something different. Downsizing in this case refers to the size of the cars American automakers are producing. It turns out they're getting smaller, as the industry focuses more on fuel-efficient vehicles. Of course, experts have been begging Detroit to build smaller cars for years. At first, Detroit wouldn't listen, because it was making so much money on trucks, SUVs, and other behemoths that Americans liked to drive. Eventually consumer tastes shifted, albeit modestly, as fuel costs rose. But by then Detroit couldn't listen, because its high overhead costs made it impossible to turn a profit on smaller, less expensive cars. Things finally hit a crisis point two years ago when, thanks to a recession that was depressing all car sales, Chrysler and General Motors ran out of money--and seemed destined for liquidation, likely taking Ford and the entire auto supply chain with them. OK, you know that story. And you know why the auto industry apocalypse didn't happen: The Obama Administration engineered a structured bankruptcy, in which the government would provide transition financing so that best part of each company would survive and get a chance to prove itself. Contrary to critics who attacked it as a "bailout," the process was far from painless: Workers lost jobs, retirees saw benefits become less secure, investors took a bath. But now even many of those criticizing the move now acknowledge that the American auto industry is on the rebound, with GM winning prestigious car awards, Chrysler finally rolling out new products, and, oh yes, the companies paying back most of the money the government loaned them. Prodded first by rising federal fuel economy standards, then shocked in 2008 by $145-a-barrel oil and a global credit crisis that forced General Motors and Chrysler to seek federal bailouts, Detroit is making a fundamental shift toward lighter, more fuel-conscious cars — and turning a profit doing so. Japanese automakers still hold a lead in overall fuel economy, and Toyota, despite its recall troubles, remains the top seller of hybrids with its Prius. With oil prices once again trading around $90 a barrel and gasoline topping $3 a gallon, the American auto companies are pushing hard to accelerate their green transition. G.M.’s new chief executive, Daniel F. Akerson, has told his product executives to plan for oil at $120 a barrel and gasoline at more than $4 a gallon, according to company insiders. The Obama administration is also nudging the industry along with money for cutting-edge auto technology. The Energy Department has made nearly 50 grants worth $2.4 billion for research and manufacturing. G.M. 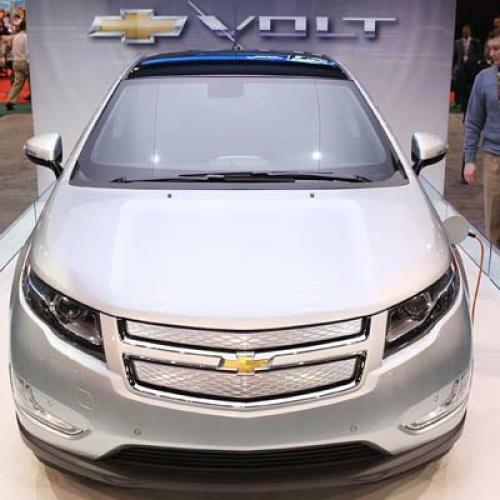 alone received $241 million, most of it related to the [Chevrolet] Volt. The government-sponsored bankruptcies of G.M. and Chrysler, and significant reorganization at Ford on its own, have restored fiscal health to the industry, which had been reeling from overcapacity, huge health care costs and a collapse in consumer credit. Now Ford can make money building the Focus in its former S.U.V. plant. Health care costs for retirees, which used to add about $1,500 to every vehicle made in a union plant, have been offloaded to a trust administered by the United Automobile Workers. The union has also trimmed staff levels and agreed to lower starting wage scales to bring down manufacturing costs. Both G.M. and Ford are expected to report impressive profits for 2010, despite annual United States sales well below the 17 million that the industry sold a few years ago. Chrysler, which is still losing money, is lagging in the switchover from trucks to smaller cars as it awaits new products from its Italian partner, Fiat. A lot could still go wrong for the auto industry and the focus on fuel-efficient cars, which the government has pushed hard, is one of the major question marks. As discussed in this space previously, there are plenty of smart, respectable experts who question whether this sort of industrial policy can work--and who worry that, a few years from now, the industry will be saddled with a bunch of electric cars and specially-built batteries that consumers don't really want. But the signs to this point all look favorable. And Depression-like conditions have not swept through the upper midwest, as seemed all too possible while the debate over the bailout was taking place in Washington. Speaking of that debate, this might be a good time to remind everybody of the key role played by Gene Sperling, whom Obama just named director of the National Economic Council. In early 2009, administration advisors disagreed over what to do with the auto industry and Obama himself struggled with the decision. As Marc Ambinder notes today, Sperling became a passionate and, ultimately, persuasive advocate for helping both endangered companies, warning that "it's over for Detroit" if Washington sat on the sidelines as most Republicans and even some Democrats were urging. Sperling, a Michigan man, knows something about the auto industry. More important, he knows something about the millions of people whose livelihoods depend on it. That's one more reason to feel good he'll (continue) to have the president's ear.